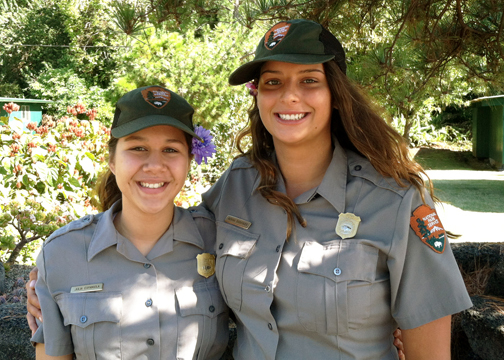 Recently, I sat down with a few park rangers including two youth interns. An original story was posted on Kalev.com, but the Wild and Free Project has exclusive rights to audio and video content from the park and interviews. Check it out here. Look for these exclusives in upcoming posts! They are just too good to give you all at once. Scenery, extra interview material, and amazing recordings of Kahuku park just being a park. Throughout Kahuku park on the big island of Hawai’i, overgrown gates, grasslands, and fields are reminders of ranching practices that once ruled the land. Today, Kahuku belongs to Hawai’i Volcanoes National Park and is in the process of active restoration and public use. Kalev.com contributor Karyn Boenker spoke with park rangers about the history of ranching, ancient forests, and the lives that lead them to Kahuku. Kahuku park is a special place, “We’ve got the foundation for this forest to come back, it’s just been waiting,” U.S. National Park Service Ranger Rita Pregana told Kalev.com. She pointed to the Ohi’a trees (pictured) as an example of the forest’s resilience, noting that visitors should be keen to notice the life that gathers in their shade and around their soil. Even among the lava fields. The ultimate goal of the US National Parks is to protect resources through a balance ofpreservation and public use. Protecting the open space is important, but leaving some of it preserved for visitors provides an experience with nature in its most raw form. “If not for the ranch, we wouldn’t have such a large piece of land left in Hawai’i,” Pregana told Kalev.com. In Kahuku’s ranching days, mature native trees were left behind to attract fog and keep the grass healthy for cattle. Wind turbines are visible from the Glover Trail system, which is the southern most point in the United States. Most ranching spaces in Hawai’i have cleared trees completely from the land and are used for ranching indefinitely or become defunct. Theland management choices made in Kahuku were unique, sparing some native and mature trees that now provide seeds for the forest to recover. According to the land manager at the time,Harold Fredrick Rice, Jr., the goal of preserving healthy native trees was not conservation related, it was practical. More trees meant more fog, which led to healthier grass and more food for fewer cows.